Updated 09.12.2018: Are you planning a road trip in the American Southwest? 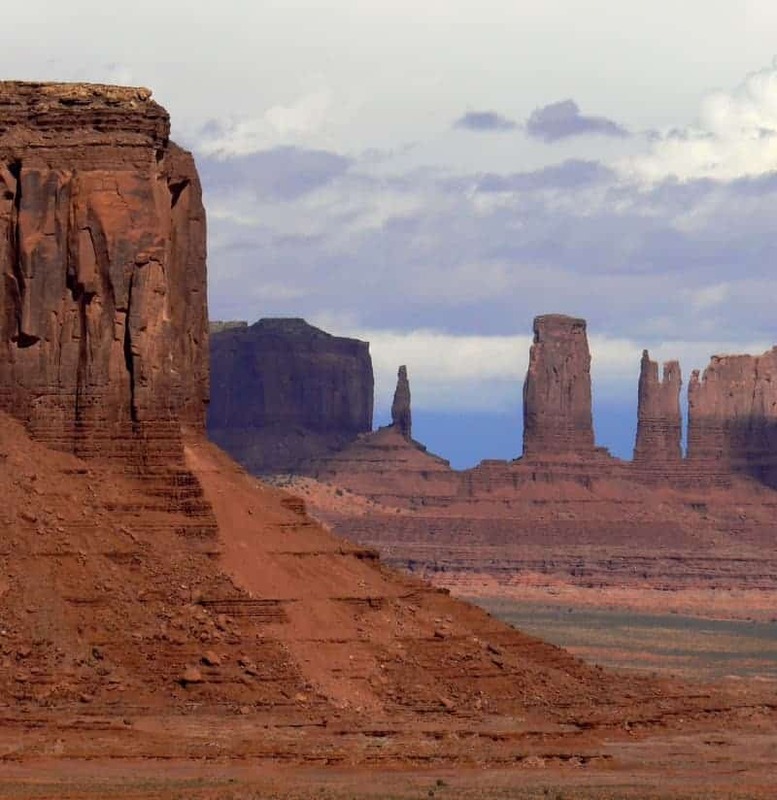 A scenic drive in Monument Valley Navajo Tribal Park on the border of Arizona and Utah places you in the middle of nature’s wonderland of spires, buttes and red rock creations. Grab your camera (I use a Panasonic Lumix) and let’s get started! Monument Valley is probably the most iconic destination in the American Southwest, after the Grand Canyon. Because of photos and movies, it’s a familiar scene to most of us, especially baby boomers. But the best part, driving in Monument Valley is easy to do on your own. It’s one of our all-time favorite adventures in the American Southwest. 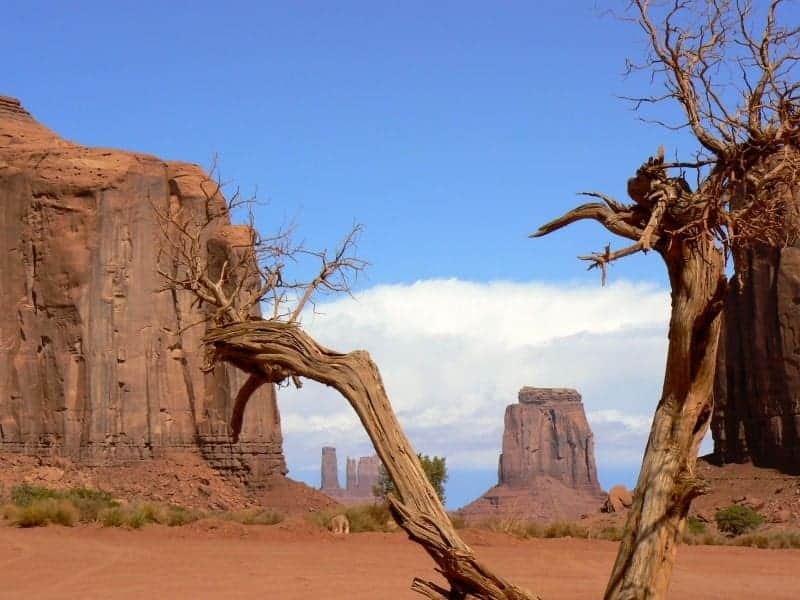 Of course we have plenty of travel tips to make your trip to Oljato-Monument Valley (the official Navajo name), the best it can be. 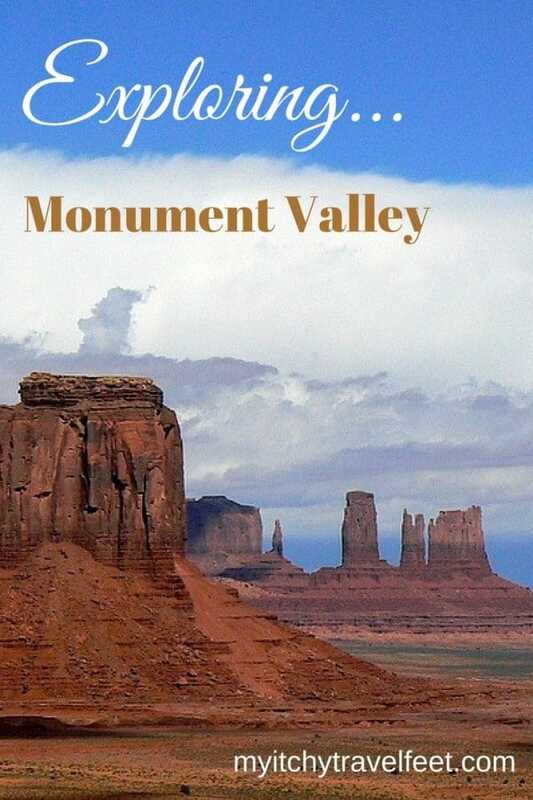 This article describes what to see on a Monument Valley scenic drive. Lodging tips and other travel suggestions are included at the end so keep reading. To make the most of a Monument Vally drive, arrive before the sun rises. No, you won’t be able to begin the drive, but you don’t want to miss the chance to photograph the sun rising behind East and West Mittens. Arriving early also gives you a chance to try Navajo fry-bread for breakfast at the View Restaurant in the Visitors Center before the 17-mile road through Monument Valley, opens for traffic. That’s how Alan and I began our boomer travel adventure. 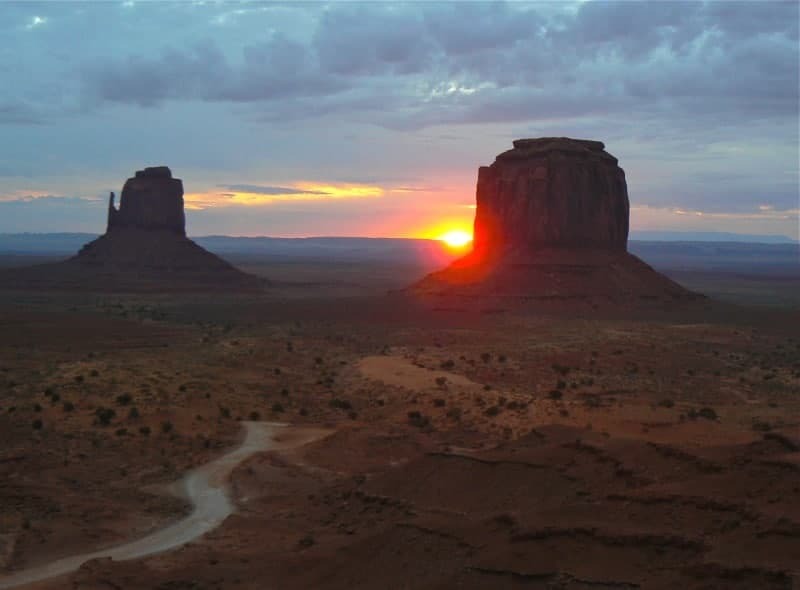 Seeing the sunrise at Monument Valley is a must do! General admission to drive the 17-mile scenic loop road is $20 per car for up to 4 people, ages 9 or younger are free (2018) and includes a free Monument Valley drive map. Admittance hours change according to the season, so check here when planing your trip. Although you can drive the road through Monument Valley yourself, for a deeper experience, hire a guide. You’ll learn about Navajo history and culture, plus have access to off-limit areas. Visitors must stay near the road and are not allowed to hike toward any of the formations unless accompanied by a paid guide. Be sure to bring drinking water as there are no facilities in the valley, not even restrooms. The sun in this part of Arizona and Utah is strong, so wear a hat (click here for my favorite travel hat) and apply sunscreen! I like Coppertone Sport (click here for current price on Amazon) because it’s water resistant so it doesn’t sweat off. The scenic drive in Monument Valley includes 11 numbered stops, which are notated on the free map provided by the Visitors Center. Plan on spending at least two to four hours to get the most out of the experience. After negotiating the steep (and sometimes rough) first 1/2 mile down Mitchell Mesa into the valley, the Monument Valley road levels out. Although you’ll read advice that a 4-wheel-drive vehicle is necessary, that’s not the case. However, you do not want to be in a low riding vehicle as you could experience a few clearance issues. And don’t rush—this journey is about taking it slow to appreciate (and photograph) the view. #1 The Mittens and Merrick Butte: Probably the most easily recognizable of all the Monument Valley formations, you’ve seen East Mitten, West Mitten and Merrick Butte in countless photographs. Here’s your chance to take one for your memory book. #2 Elephant Butte: The road veers to the right here and climbs slightly. The sheer sandstone Elephant Butte sits atop a red ridge. Go slow, the road is bumpy! #3 Three Sisters: As you can see from this photo Three Sisters makes a great photo stop. It’s worth spending a few minutes here wondering just how nature accomplished such a sculpture. 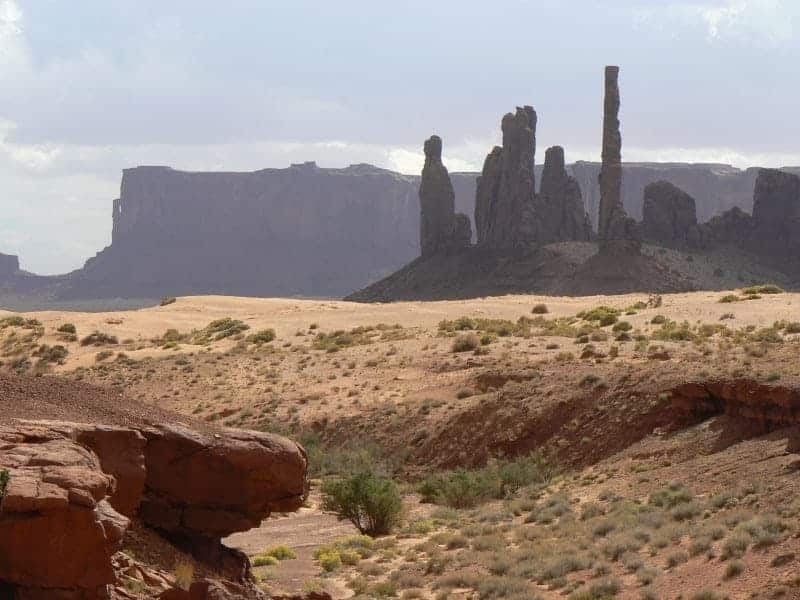 #4 John Ford’s Point: Another well-known—and slightly touristy—stop in Monument Valley, this spot is named for John Ford, director of the movie, Stagecoach, starring John Wayne. Monument Valley has been the location for many movies and television shows. Easy Rider and Forrest Gump are two familiar movies with scenes that were shot in the valley. But did you know that Clint Eastwood was filmed atop one of the spires for The Eiger Sanction? A spur road brings you to John Ford’s Point where a rocky promontory juts out over the desert offering a commanding view of where you’ve just driven. The large parking lot makes for a popular tour bus stop so arrive early to avoid the crowd. Spend a short time browsing in the Navajo jewelry store. You can also pay $2 to photograph a Navajo rider posed at the end of the promontory. Even if you aren’t into tourist spots, it’s still worth spending a short amount of time here. From this point on, the road becomes one-way. #5 Camel Butte: Not as picturesque as some of the other stops but it’s worth noting that you are at the highest point of the drive. You’ll notice dirt tracks leading off in several directions. It’s tempting to venture off to explore them but don’t as your entry only allows access to Valley Drive. #6 The Hub: You’ve arrived at a 150-foot high solitary spire that sits in the middle of a valley. You can also see Rain God Mesa, Elephant Butte and The Three Sisters. #7 Totem Pole and Yei be Chei: If you’re looking for a photogenic spot in Monument Valley, this is one of my favorites. 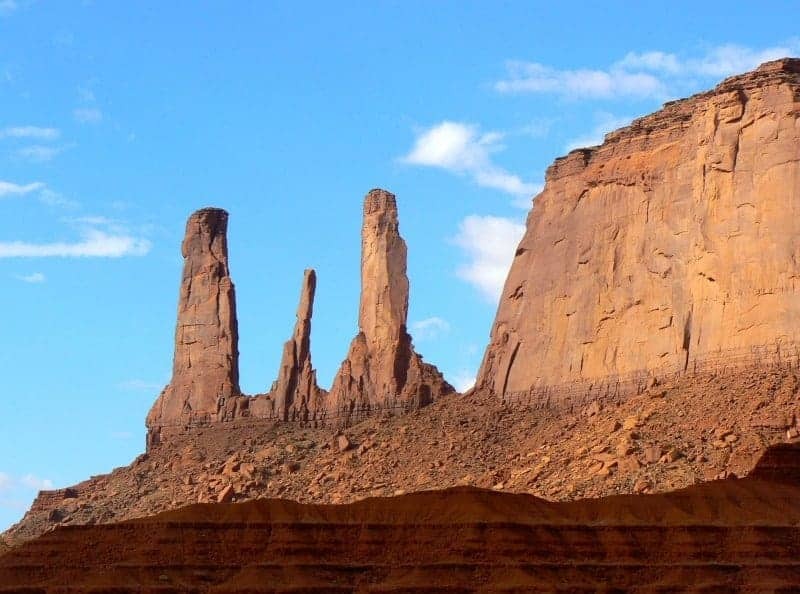 The Totem Pole spire sits beside the Yei be Chei formations with Hunts Mesa hulking in the background. The ground becomes increasingly sandy in this part of Monument Valley. #8 Totem Pole and Sand Spring: The orange-red dunes of Sand Spring are the reason for pulling into the parking area at the edge of Spearhead Mesa. After admiring the dunes turn 360 degrees for more views of Totem Pole and Yei be Chei. Blowing sand can be a problem on this part of the drive. But that sand also provides the opportunity for photographing some cool patterns. #9 Artist’s Point: Sitting on the edge of a plateau, Artist’s Point provides views of East and West Mittens, Merrick Butte and a vast expanse of desert. Bring your zoom lens and stay awhile. Or perhaps it’s time for the picnic lunch that you packed. #10 North Window: Once you’ve parked the car, taking a photo of East Mitten—you can’t see the thumb from this perspective—through the branches of an old tree stump is a must. Walk the 1/3 mile dirt path to see exactly why North Window is the most popular, and potentially crowded, stop on the drive. Now you know why I suggested unpacking your lunch at Artist’s Point. 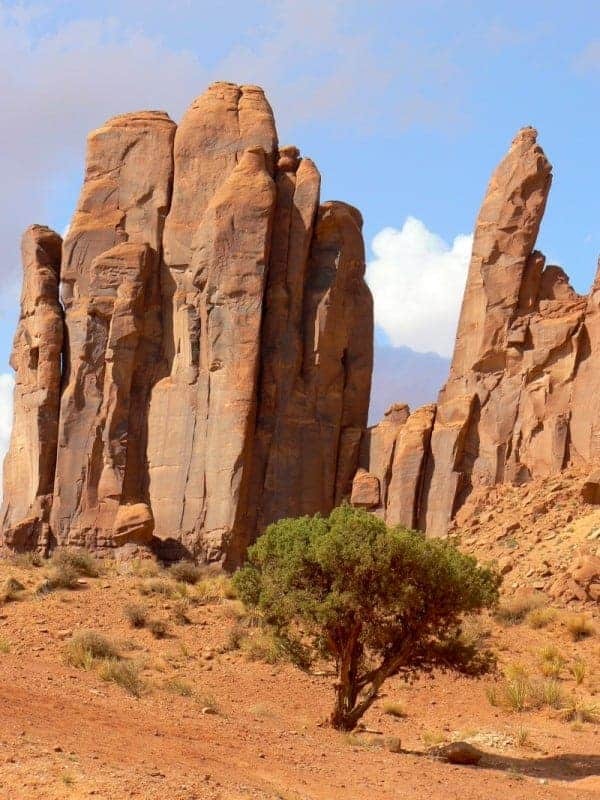 #11 The Thumb: A stone monument that’s true to it’s name, The Thumb is the last stop on your Monument Valley driving adventure. But I have one more suggestion. As your vehicle climbs up the rocky road onto Mitchell mesa, look back in awe at at the natural wonder that you’ve just witnessed. Do you still have enough energy for a hike? 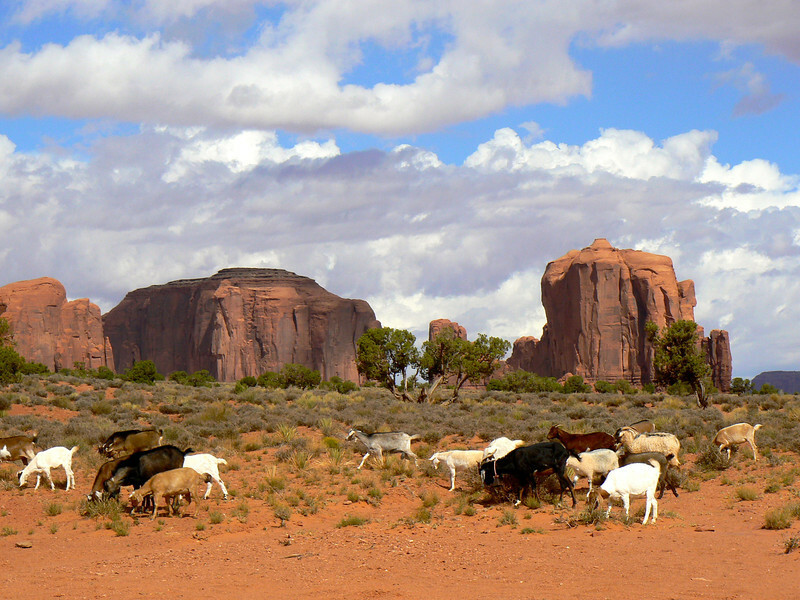 Yes, we saw goats in Monument Valley. Before leaving Monument Valley, get out of the car for the 3.2-mile Wildcat Nature Walk around West Mitten Butte. Don’t forget to bring water! What about hotels in Monument Valley? Kayenta is the closest town (23 miles to the south) with lodging; but I’d rather wake up with a Monument Valley view outside my window. If you agree with me, then plan to stay at The View (the Navajo hotel at Monument Valley) or Gouldings Lodge. Although Gouldings doesn’t have the same killer view, you’ll be surrounded by legends of the historic trading post turned lodge. To escape the tourist crowd, drive 33 miles north on Highway 163 to Valley of the Gods Bed and Breakfast. Or continue even a few miles farther north to Desert Rose Inn in Bluff, Utah (a step above the rest quality wise, in my opinion). 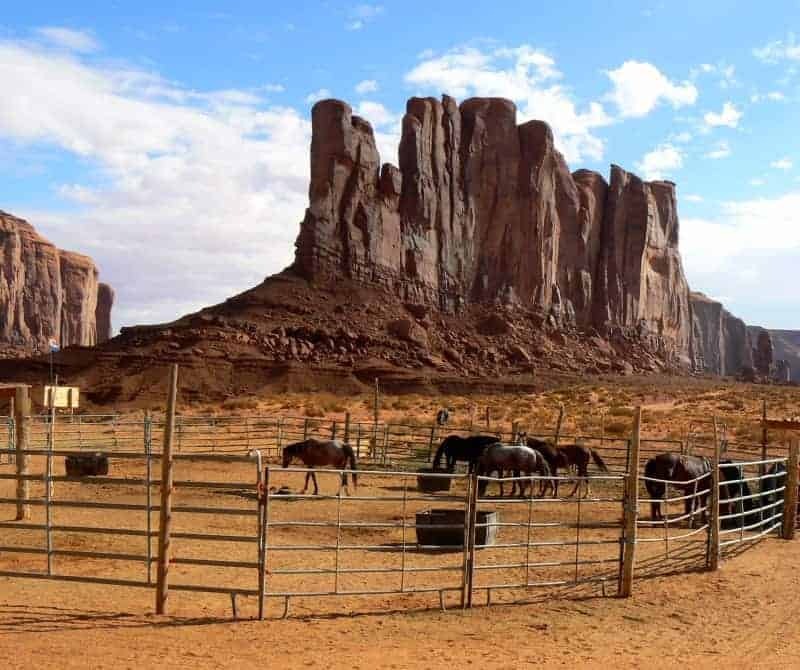 Both accommodations make a great headquarters for visiting other sites in the area such as Valley of the Gods, Goosenecks State Park, Cedar Mesa, Natural Bridges National Monument, and Canyon de Chelly among many others. When is the best time to visit Monument Valley? Fall and spring provide the most comfortable temperatures, especially September/October and April/May. Avoid the summer months, if you can, as it is hot in the desert. Is a Monument Valley Guided Tour worth it? As I mentioned earlier, those choosing the Monument Valley self-guided tour must stay on the main road. The next time Alan and I visit the area, we’ll book a Navajo guide for a trip on the Mystery Valley Tour. Private tours offer access to petroglyphs, Anasazi dwellings, a couple of sandstone arches and more rock formations. Some tours include a night of communing with nature while camping under the stars on Hunts Mesa. 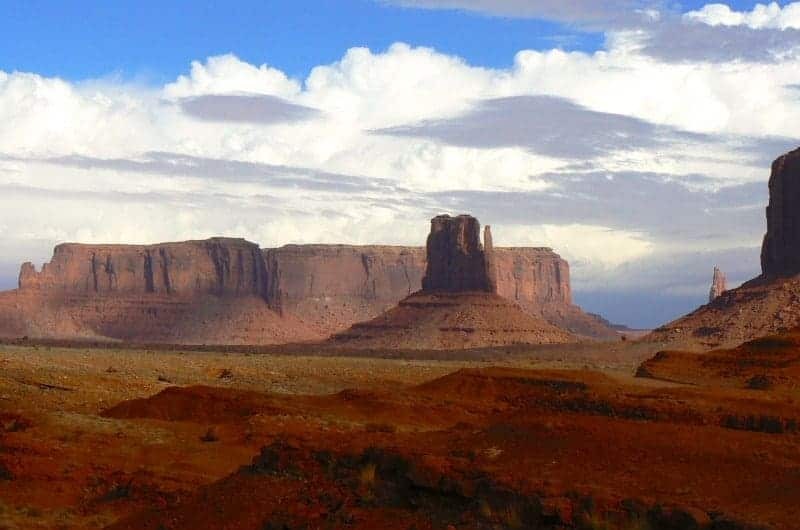 Although the scenery is stunning in its own right, the real meaning of a trip to Monument Valley comes when one learns about the culture and history from the Navajo point of view. Canyon de Chelly National Monument, about 1.5 hours away in Chinlé, AZ, offers another scenic look at Navajo history. Drive the rim road on your own, with a stop to hike down to White House Ruins Trail (the only permitted canyon access without a guide). However I recommend booking a guided tour into the canyon to see Spider Woman Rock or Mummy’s Cave. Visitors cannot drive into the canyon unescorted. Navajo National Monument, about 1 hour away near Shonto, AZ, is home to two prehistoric Pueblan villages: Betatakin and Keet Seel. The villages are built into the walls of Tsetgi Canyon. A paved rim trail near the visitor’s center offers good views. Or take one of the guided, strenuous hikes (5-mile-round trip or 3-mile-round trip) for a closer look at Betatakin. Located in the backcountry, hiking the 17-mile-round-trip hike to Keet Seel is limited to 20 people per day and requires a permit. Valley of the Gods, about an hour up the road in Mexican Hat, UT, is a mini Monument Valley. You’ll find the same beautiful scenery without the crowds or vendors. The loop road is rough in places, plus it crosses several washes. However the isolation is well worth the hassle. Top off your drive by staying at Valley of the Gods Bed and Breakfast. Natural Bridges National Monument, about 1. 5 hours away in southern Utah, offers three sandstone arches to explore, as well as plenty of hiking. Named the first International Dark Sky Park, Natural Bridges offers stunning views of the night sky. Add to the adventure by driving the Moki Dugway to Cedar Mesa and on to Natural Bridges. Let me know what you think of the hairpin turns! Planning a trip to Utah? Check out our Utah Travel Planner. Do you have questions about visiting Monument Valley? Join the conversation at the My Itchy Travel Feet page on Facebook or send us an email.